A flat leather needle case or ‘housewife.’ The two large flaps covered in felt fold together, then the third smaller flap folds over them to hold it closed. I sew by hand, and I like to use this needle case. It holds pins better than my pincushion, it is easy to pack away and set up wherever I am working, and I like the feel of the stamped leather in my hand. I bought it from someone at a medieval fair 20 years and several lifetimes ago. Now, if you ask most people how ancient and medieval people stored pins and needles, they will show you metal or bone cylindrical cases with lids, and maybe speculate about leather or wooden versions. As for the pins and needles themselves, they will usually point out clumsy things suitable for making sails or picking a lock. But there is a problem of evidence. They point to these things because they appear in collections of small finds and are reported by metal detectorists. And wee little fishbone or steel needles don’t survive as well as giant bronze ones, and are not as easy to detect and identify. A folding needlecase is just as hard to spot, especially if it is not of vegetable-tanned leather. Hide which is treated in other ways, with drying, oil, fat, or alum, tends to break down in the ground, and in many cultures these other treatments were much more common than tanning with oak or other sources of tannins. 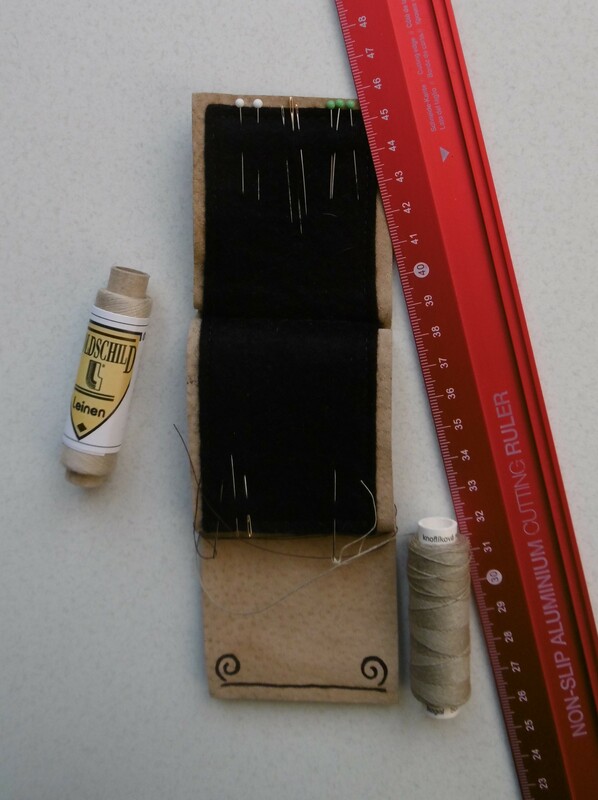 A folding needlecase also suits conditions before the 20th century, because it required few materials or tools: just a scrap of leather and felt, which can be made from the ‘cabbage’ left over from cutting larger items, and a needle and thread to put it together. Before the 20th century, preparing the materials for clothing was usually much more expensive than turning them into a specific product. So how long have people been using these before someone at the fair sat down at their crafts table to earn some pocket money? I have no idea. But I would expect it to be very long indeed, and much longer than I can prove. In studying ancient history, you have to accept that all kinds of things were done which you can’t prove. And I am OK with that. Further Reading: http://larsdatter.com/sewingkits.htm Carol van Driel-Murray of the Archaeological Leather Group has been one of the leading figures in laying out the evidence that vegetable tanning was not the dominant way of treating hides in the ancient and medieval world.